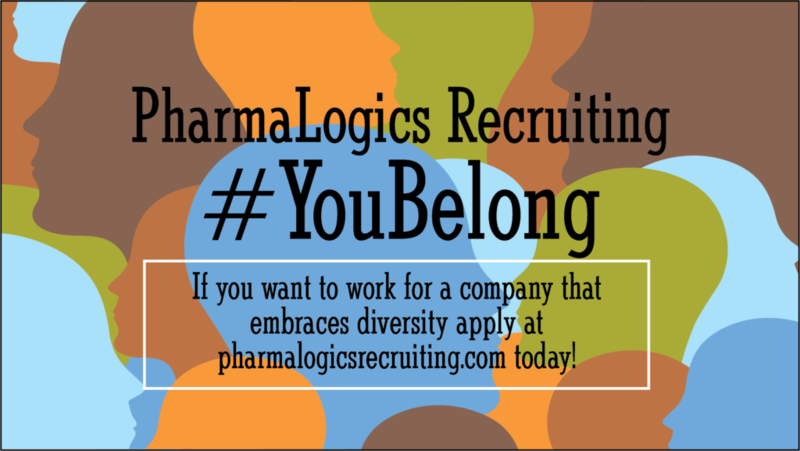 PharmaLogics is thrilled to introduce our new initiative, #YouBelong. While we are proud that PharmaLogics has always been a safe and welcoming place to work, our employees have decided to establish a clear organizational commitment to align our operational practices with our commitment to diversity both internally and externally. We would like to be intentional about implementing the importance of diversity into our cultural DNA; to make it a part of every discussion and business decision we make this year and moving forward. The idea for #YouBelong began as a hiring initiative with a focus on diversity. As an organization in general, but also as a recruitment firm, PharmaLogics understands the value of a diverse workforce. In early 2018, we began having monthly diversity meetings where our employees discuss how we can improve our current workplace while making it more welcoming to potential hires. Focusing on hiring more under-represented candidates is not just a feel-good move, it’s the right business decision and our employees understand that. Countless studies over the past few years have shown that diverse teams are more creative and increase company bottom lines. Having a more diverse set of employees results in a more diverse set of skills which results in a business that functions better. At PharmaLogics our employees are diverse by gender, race, sexual orientation, background, and mindset. Having a diverse workforce and learning from each other’s experiences allows us to better understand and support our candidates and clients. In an industry where people are our business, it’s important that we maintain a clear and intentional commitment to diversity internally with our own people, as well as externally in placing talent. From our monthly diversity meetings, our employees collaboratively came up with the initiative, #YouBelong. #YouBelong means that #YouBelong at PharmaLogics the way you are. PharmaLogics is accepting of everyone. We are committed to improving our workplace, diversifying our staff, and always putting our people first. We hope that #YouBelong is a step in the right direction to show our dedication to this commitment. If you are interested in joining PharmaLogics Recruiting, please apply at pharmalogicsrecruiting.com.